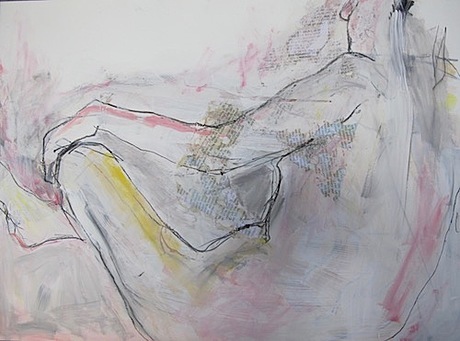 Fine Print, mixed media on Paper, 22" x 30"
My approach is tactile and responsive, utilizing mixed media for materials and the live model, or whatever is coming forward in my imagination, as my subject. I sometimes begin with a drawing of my subject, usually in charcoal, then make additions of paper, paint, smaller images, more drawing and more layers of media. Sometimes I take the opposite approach. The process of the work is challenging and exciting simultaneously. I work intuitively and quickly. Experimenting without worry over perfection of placement of color or media, I love the random effect of layering unlikely materials and marks. The goal of my art making, beyond self-expression, is to free myself from ego and self-criticism, connecting me more deeply to myself and releasing me from the constraints of academic training. As I work, I am pulled more deeply to my authentic self. My favorite place is in that fluid, expansive space that stimulates imagination, creativity.